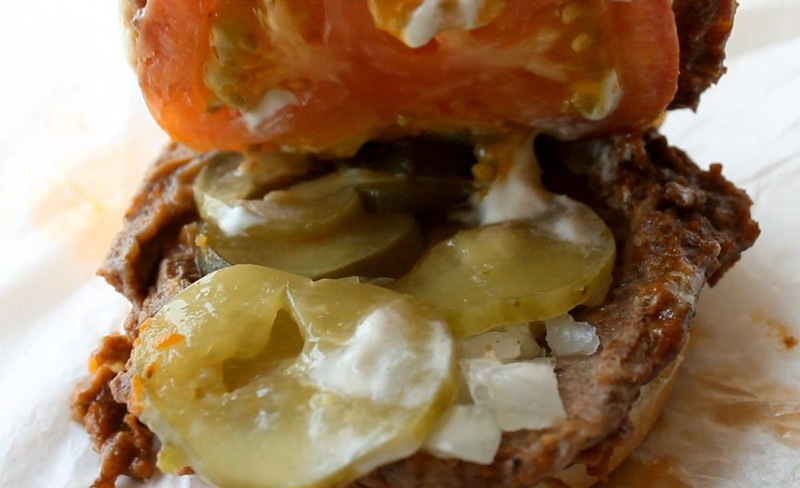 If you live in LA, then you've heard about the Tommy Burger. Next to In-n-Out Burgers, Tommy's is at the top of the fast food burger heap. And, so much so that there are many imitators trying to pull off a homonym scam by calling their burger joint similar sounding (and spelled) names like: Tomy's, Thoma's, Tommie's, Toms, etc. But don't be fooled -- there's only one Original Tommy's Hamburgers and I have the heartburn and a Cheap$kate Dining Video review to prove it! The Original Tommy's shack, on Beverly Blvd., has been around since 1946 - that's older than McDonalds (1954) and even In-n-out Burger (1948.) While Tommy's doesn't have the fanatical fan base of In-n-Out Burger, it has plenty of customers, and operates in over 25 locations throughout LA county. The one I go to most is on Hollywood Boulevard, at Bronson Avenue. A Tommy Burger is an eccentric burger, and I like it that way. First off, there is no lettuce, but you won't miss it, since all the burgers come with plenty of chili. Lettuce and chili don't go together anyway. And it's one sour burger with the addition of 4 pickle slices and mustard. It's too much of a puckering good thing, so I always ask for some creamy mayo. 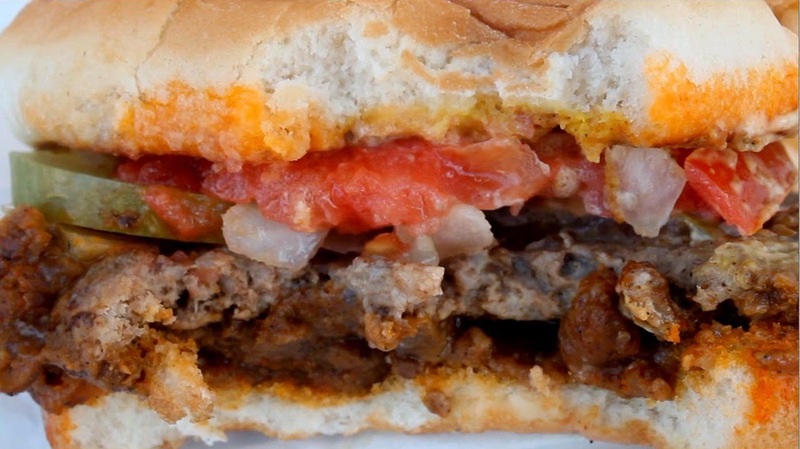 But the most unusual ingredient is a huge, juicy, tomato slice, that's about as thick as the hamburger bun. While the tomato is no big shakes (it tastes like any regular store-bought variety) -- but, that's just what this chili burger needs to balance out the disparate flavors. Chili's all it's about at Tommy's. The chili is of the fine-ground variety and no beans. (It's very similar to Pink's Hot Dogs chili, another fantastic fast food joint in Los Angeles - my blog post video of the hot dog landmark is here.) 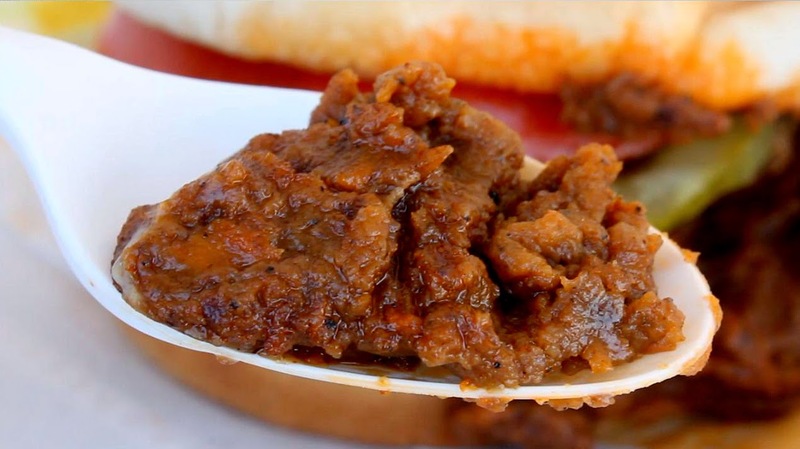 Like a meaty thick gravy, the flavor is just what I want, beefy and spiced perfectly. It's best eaten right away while the chili is hot. They pile it on, so make sure to get a plastic spoon and a couple extra napkins. And, if you get it at the drive thru window, just pull over in a parking slot. Please resist eating it on the drive home - much too messy and dangerous to maneuver! And as a special visual treat, I shot my on-camera review in the middle of the public art assemblage "Urban Light", by one of my fav LA artist, Chris Burden. 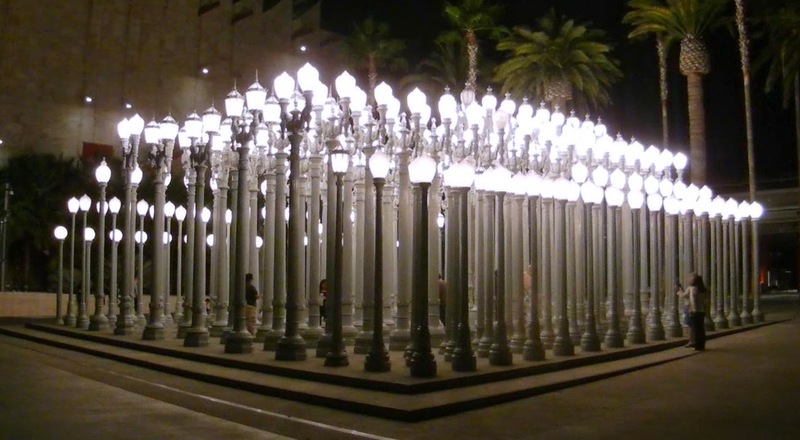 To read about the city lamp assemblage click here, and make sure to add it to your Los Angeles art bucket list (it's best viewed at night - plus it's free to see.) Leave it to The 99 Cent Chef to combine a chili burger with art! A Tommy Burger is not for the faint of palate. Flavors are intense, the chili is like heavyweight oil, and it's a hot mess -- just the way I like it. And it's a less expensive, at $2.15 (plus tax,) than a Big Mac. Now, that's a great cheap$kate deal. So check out my video below to see how The Tightwad Restaurant Critic rates a Tommy Burger on a scale of 1 to 9, 9 being best. 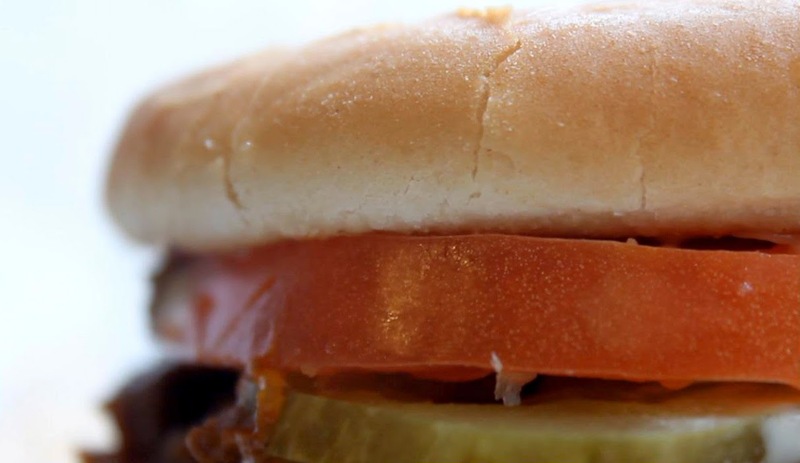 And if you are new to LA, or plan on visiting soon, make sure to chow down on one of our top 9 burgers, a Tommy Burger. Play it here, video runs 2 minutes, 46 seconds. I love my chili burgers with mustard. A friend introduced me to the chili-mustard combo on a ham sandwich which while sounding odd is also quite good. I ate at Tommy's when I was a little kid growing up in LA. We also ate at a hot dog stand in the shape of a hot dog but the name escapes me. Thanks for the memory. Single greatest chiliburger in the world. I would kill my flatmate for one right now.